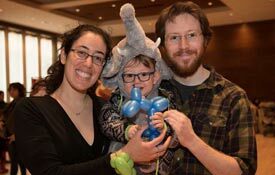 Beth Israel provides a rich Jewish environment for families to come together and celebrate Shabbat and other holidays. 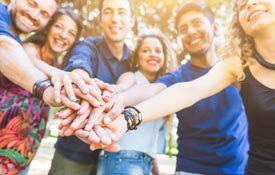 We aspire to create lasting memories for families to carry on through the years. 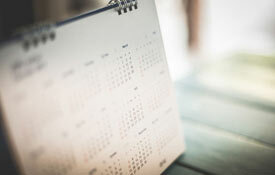 Our aim is to help you connect with G-d, Israel, and Torah in ways that work for you. 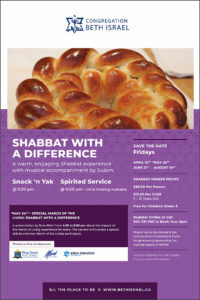 Below is a flyer of our current ongoing Shabbat program. 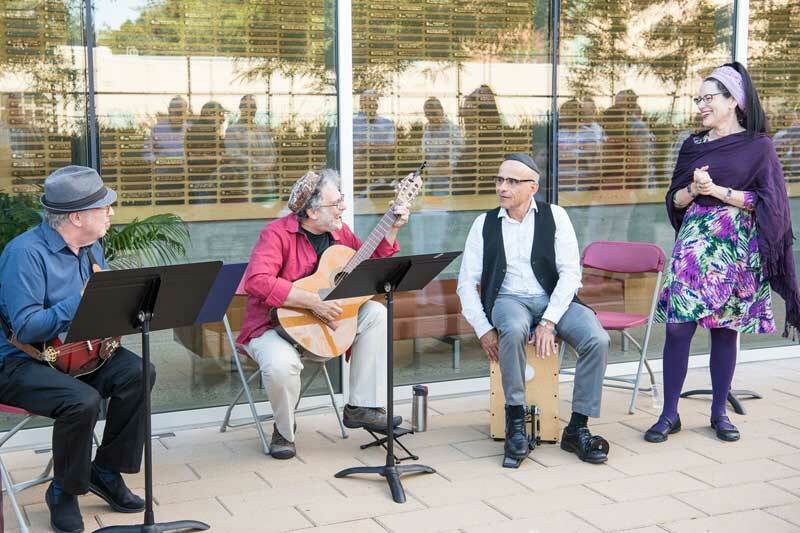 A warm and engaging Shabbat experience with musical instruments for Kabbalat Shabbat. In the summer months the dinner is held outside in our Courtyard. 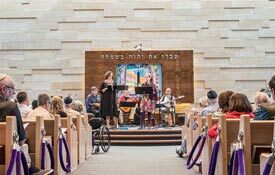 The musical service is led by Debby Fenson, our Ba’alat Tefillah and is open to all. 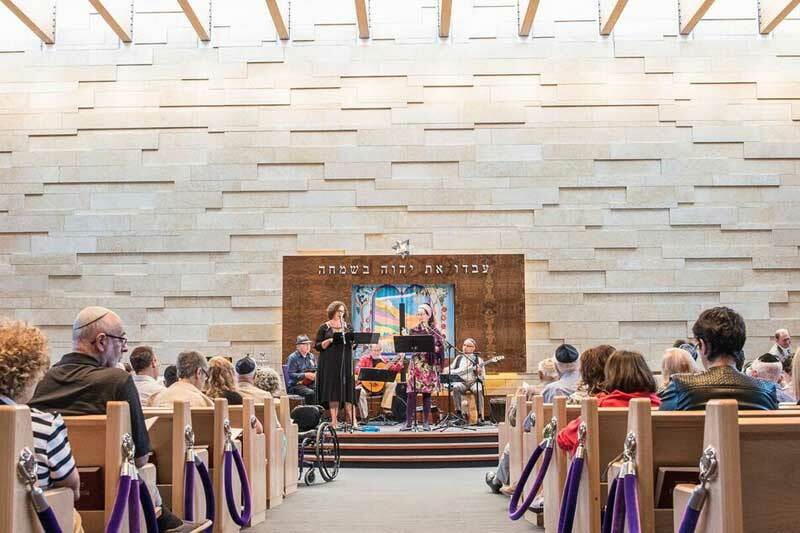 The service is followed by a relaxing Shabbat dinner. 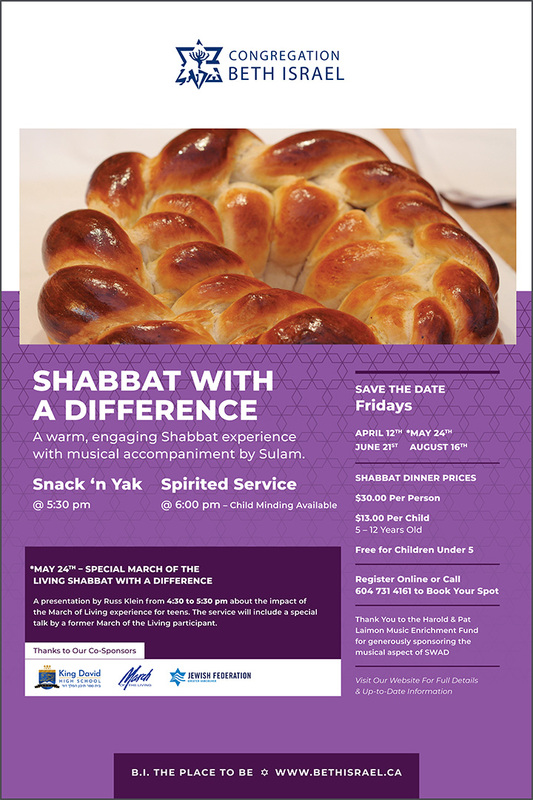 A fun and easy Shabbat dinner geared toward our young families. Grandparents are always welcomed! 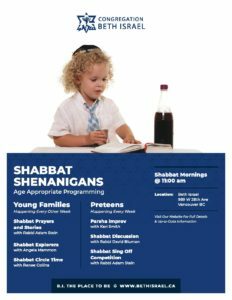 Our Shabbat dinners always start around 5:00 pm and is children friendly (as the name suggests). Dinner is followed by Friday night services thereby ensuring that your child’s sleep routine isn’t affected. 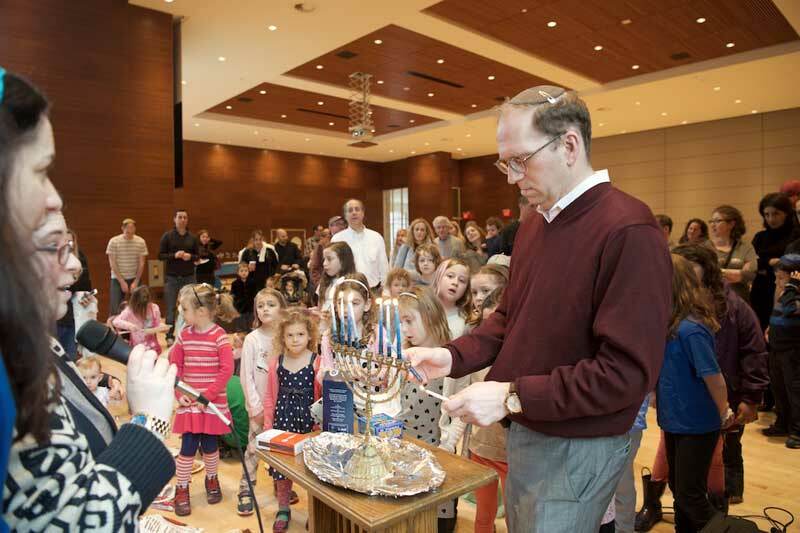 In the winter months we have organized a few ‘Havdallah with a Difference’ events. These are geared towards young kids . 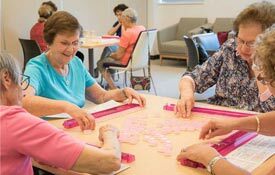 Dinner usually starts at 5:00pm and is accompanies by some Sabbath friendly games and crafts for kids. After dinner the kids join in for havdallah services. 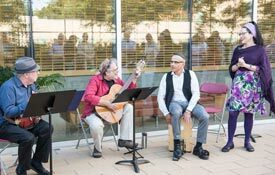 This year Beth Israel joined with Har El and Congregation Beth Tikvah and put together a meaningful Tisha B’ Av service. We had over 80 people in attendance who joined together for some creative learning prior to the start of services. A meal was also served which consisted of traditional last foods before the fast. 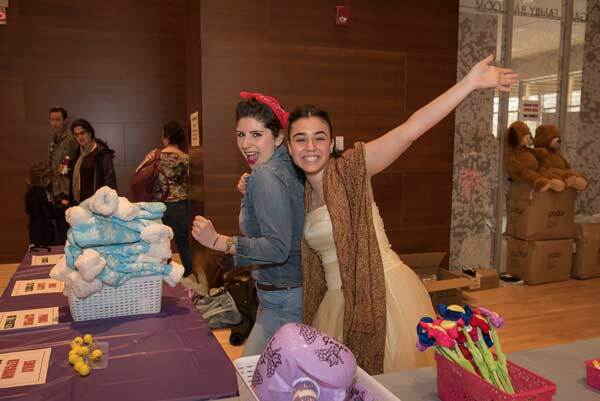 Purim is one of our biggest events and brings in kids, adults and everyone in between. 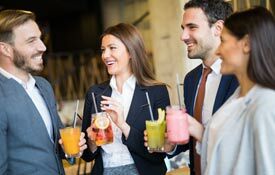 In past years we have had an ‘adults only’ Purim Party with drinks, food and entertainment. We have a Purim carnival for kids that usually brings in hundreds of people. 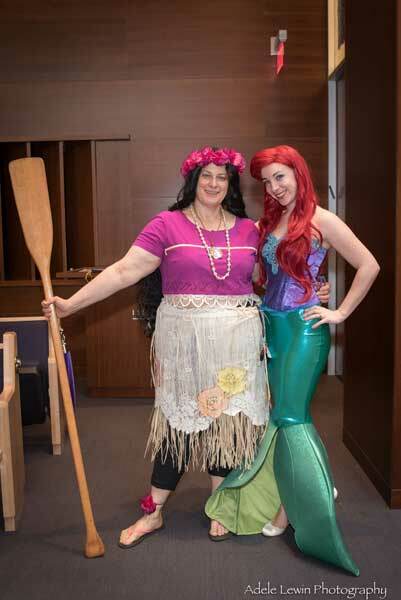 Our famous Purim shpiels are unique and have been told to synagogues around North America and are always entertaining. Join us for this family friendly holiday celebration!